American Herring Gull (smithsonianus) 2nd cycle (3cy), February 07 2005, St. John's, Newfoundland, Canada. Picture: Jeff Poklen. American Herring Gull (smithsonianus) 2nd cycle (3cy), L52 April 13 2013, Hampton beach, NH. Photo: Jon Woolf. Not all 2nd cycle are as eye-catching as the bird above; some smithsonianus will go unnoted in the European melee, unless ringed of course. If it often seems as if no two first-winter smithsonianus are quite alike, second-winter birds are even more variable. 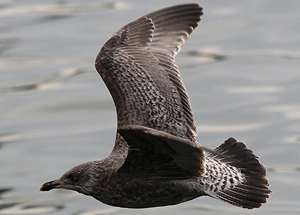 Some second-winter individuals are, at first glance, extremely first-winter-like, due to a complete lack of clear grey in the scapulars and extensively brownish underparts. Obviously pale-eyed individuals can be more easily aged but some birds do not develop a pale iris until late winter, and even then it may be difficult to discern in poor light or at moderate range. 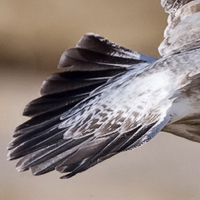 In addition, most show more intricately and irregularly patterned greater coverts and tertial-fringes (much as second-winter European Herring Gulls), a clearly pale basal two-thirds to the bill and, at close range, the primary-tips are slightly more rounded than in first-years. 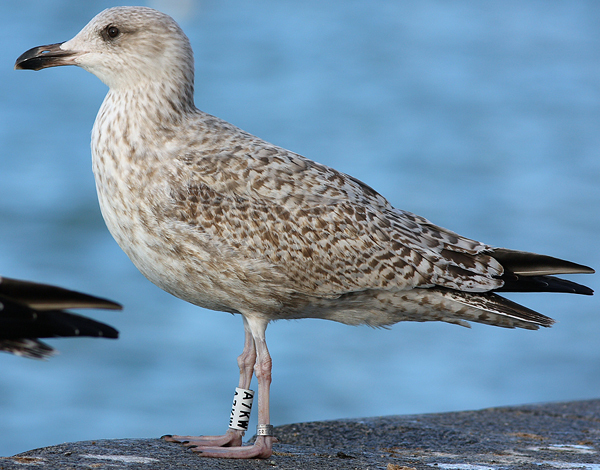 Second-winters that differ more obviously from first-winters have at least some clear grey scapulars and, much as in European Herring Gull, there is considerable individual variation between these two types. European Herring Gull (argentatus) 1st cycle (1CY) December 12 2012, Peterhead, Scotland (Chris Gibbins). Velvety dark underparts. European Herring Gull (argentatus) 2nd cycle (2CY) December 04 2010, Peterhead, Scotland (Chris Gibbins). Dark end of the spectrum, "probably from Iceland". 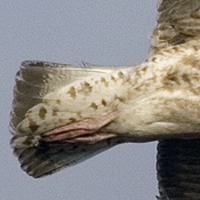 Solid darkness on lower hindneck and upper mantle, and underbody As in first-years, there is a much greater tendency for second-year smithsonianus to have dense brownish colouration on the lower hindneck and upper mantle, extending onto the underparts, than there is in European Herring Culls of the same age. This brownish ’wash' is usually less intense; more mottled than in first-years but is often still strong enough to attract attention. 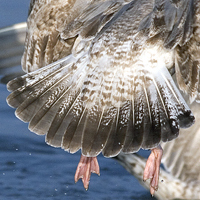 Second-winter European Herring Gulls are generally much more sparsely spotted or blotched with grey-brown in these areas. 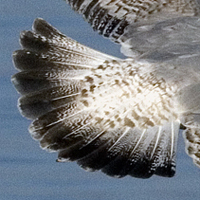 Tertial pattern There is a tendency in second-winter smithsonianus for the tertials, especially the outer tertials, to average more extensively and solidly dark-centred than in European Herring Gulls of the same age, with a corresponding reduction in the extent of pale at the tips. 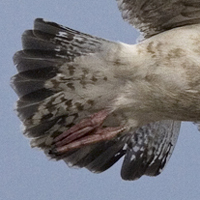 In European Herring Gulls, the tertials are often either wholly 'barred’ or have a small dark centre and broad pale tip. However, there is variation in both, and considerable overlap, so the tertial pattern should only be used in conjunction with other supporting characters. 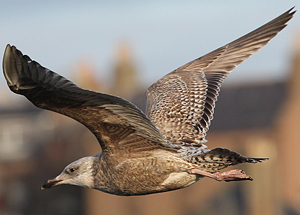 We are not able to explain why, but our observations of second-year European Herring Gulls in late summer and early autumn suggest that many at this time of year show darker and more smithsonianus-like tertials than at other times of the year. 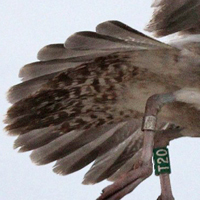 European Herring Gull (argenteus) 2nd cycle (3CY) A7KW January 11 2012, Calais, NW France. Picture: Jean-Michel Sauvage. 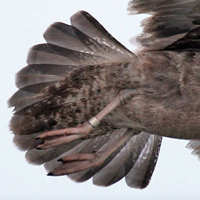 Lack of grey scapulars and barred coverts resemble 1st cycle birds. 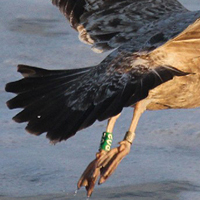 American Herring Gull (smithsonianus) 2nd cycle (3CY) K10 February 22 2013, Circle Beach, CT. Picture: Keith Mueller. Lack of grey scapulars and barred coverts resemble 1st cycle birds, but again note pale eye and different generation of tertials (upper tertials replaced in so-called "partial autumn moult" last October, central tertials replaced in complete moult in summer, hence much older. 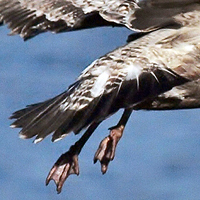 Undertail-coverts As with younger birds, the pattern of the undertail-coverts can be very useful as an aid to identification. Many second-winter smithsonianus have an almost unchanged (from that of first-years) pattern of intricate or closely spaced bars, in contrast with the widely spaced bars and spots or almost unpatterned undertail-coverts of most argentatus / argenteus, Others have solidly dark-centred feathers, a pattern, so far we know, never found in European Herring Gulls. 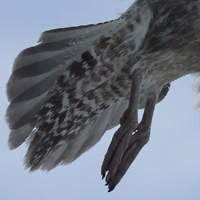 below: 12x uppertail and undertail pattern for 2nd cycle European Herring Gull argentatus, all pictures from Katwijk, The Netherlands. 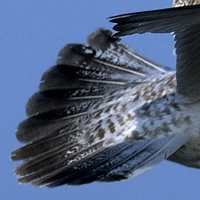 Barring on uppertail & undertail coverts only limited in these birds. 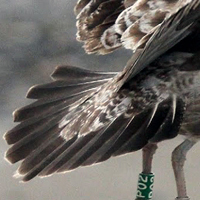 Pattern of rump and uppertail Often more obvious than the undertail-coverts (described above), many second-winter smithsonianus mirror first-winters in showing a more heavily patterned rump and uppertail-coverts and a practically all-dark uppertail (figure 2). 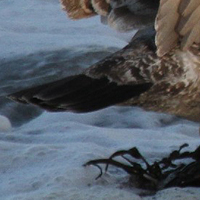 As the season progresses, the rump becomes paler/whiter, the white rump being acquired through moult rather than wear; moulting birds may have a patchy mixture of (new) pure-white and patterned brown feathers. 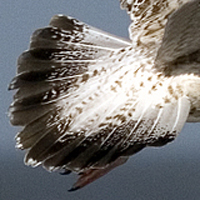 Second-winter European Herring Gulls tend to have less heavily patterned rump and uppertail-coverts and many are predominantly or wholly 'white-rumped'. Paradoxically, they often have a much more extensively dark tail than first-winters and this alone may prompt thoughts of smithsonianus. 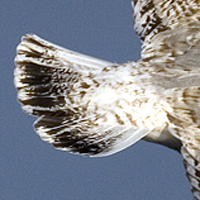 While there is extensive overlap in the tail patterns of second-winter smithsonianus and European Herring Culls, it seems that even the most extreme examples of the latter usually show a narrow wedge (widest at the base) or ’sliver' of white along the outer edge to the tail (shown by some smithsonianus too but a definite lack of white edges may be significant). 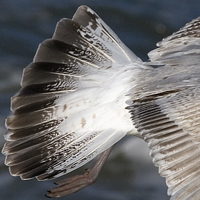 below: 12x uppertail and undertail pattern for 2nd cycle American Herring Gull smithsonianus. 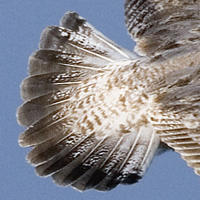 Dense barring on uppertail & undertail coverts and tail often almost completely dark. 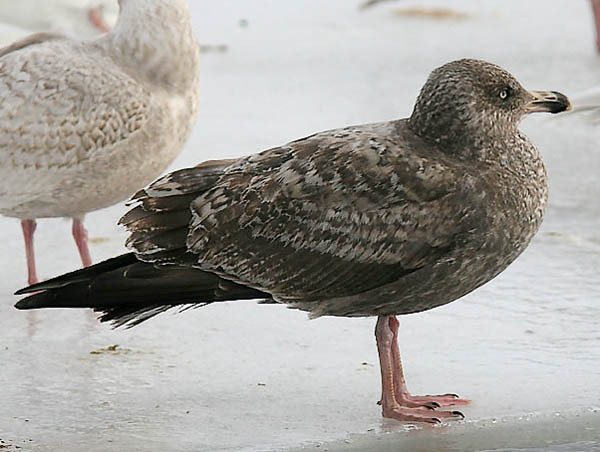 Bill pattern and colour The great majority of second-winters show an extensively pale-based bill, the pattern typically resembling that of immature Glaucous Gull. The colour of the bill-base is variable, sometimes flesh-pink (like most European birds) but often a more neutral greyish or horn colour with or without a faintly greenish tinge (plate 47). 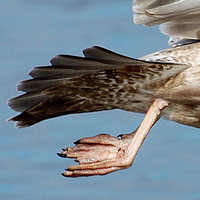 The latter would be unusual in argenteus but is not uncommon in argentatus. Bill colour remains decidedly 'immature-like' throughout winter and even early spring, being brownish, pinkish or pinkish-white basally. 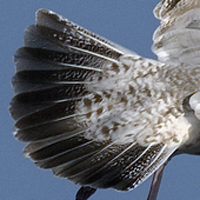 Primary pattern Like argenteus, but in contrast to a minority of argentatus, most second-winter smithsonianus lack a mirror on P10. 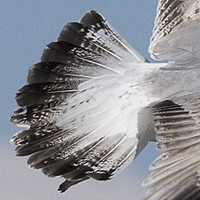 Underwing-coverts On average, more solidly dark than in European Herring Gulls. 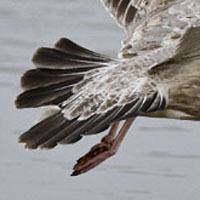 Greater coverts Slightly darker and more uniform (less barred) than in European Herring Gull, although there is considerable overlap. 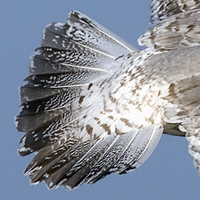 b those with entirely or mostly grey (adult-like) upperparts may often show a strong contrast between the pale ’saddle’ and surrounding dark hindneck, underparts and wing-coverts. 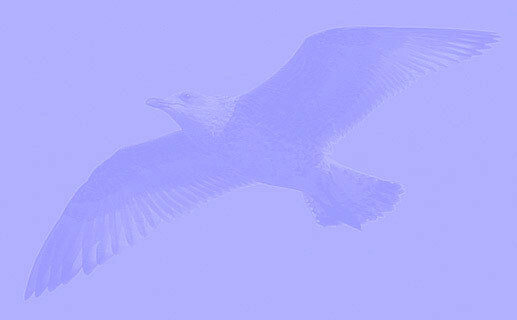 European Herring Gull (argenteus) 2nd cycle (3CY) BTO GR35748 February 10 2013, Boulogne, NW France. Picture: Jean-Michel Sauvage. Aged on new grey scapulars and pale eye. American Herring Gull (smithsonianus) 2nd cycle (2CY) M04 December 14 2012, New Haven Harbor, Connecticut. Picture: Keith Mueller. Aged on new grey scapulars, different generation tertials and pale eye. 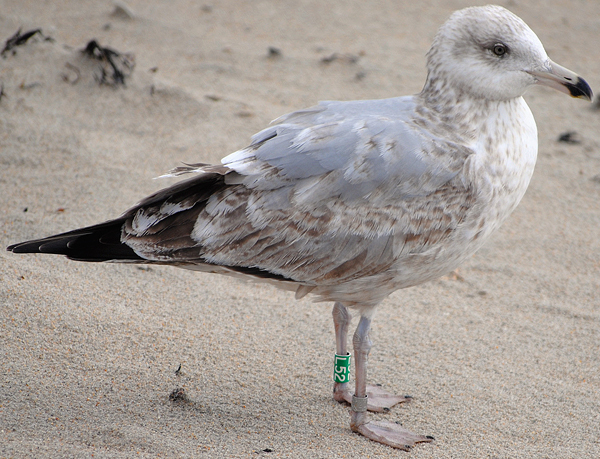 American Herring Gull (smithsonianus) 82C 2CY, July 01-09 & October 03 2015, Hampton Beach State Park, NH. Picture: Robbie & Colleen Prieto. American Herring Gull (smithsonianus) 2nd cycle (2CY) 85 / 36 October 14 2011, Herring Cove Beach- Provincetown, Massachusetts. Picture: Keith Mueller. 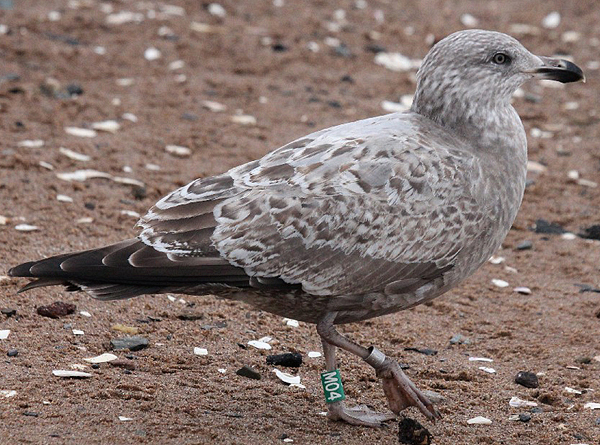 American Herring Gull (smithsonianus) 2cy (2nd cycle), October 12 2015, Weaver beach - Madison, CT. Picture: Keith Mueller. 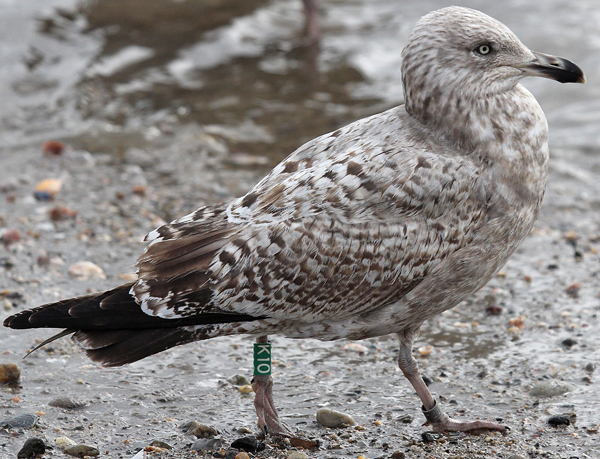 American Herring Gull (smithsonianus) 2nd cycle (2CY), October 16 2015, St John's - Newfoundland. Picture: Lancy Cheng. 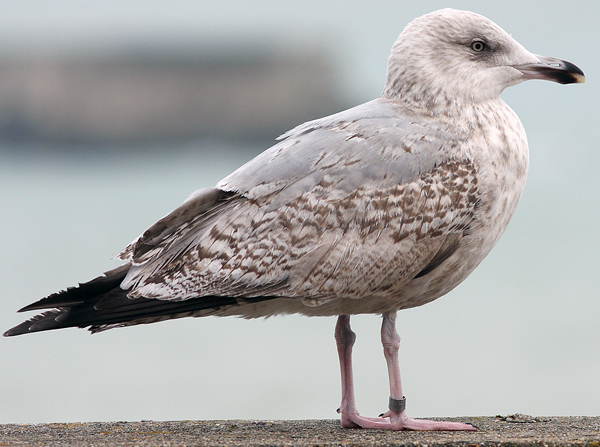 American Herring Gull (smithsonianus) 2nd cycle (2CY), October 12 2015, Lake County, Illinois. Picture: Amar Ayyash. American Herring Gull (smithsonianus) 2nd cycle (2CY), October 25 2015, St John's - Newfoundland. Picture: Lancy Cheng. 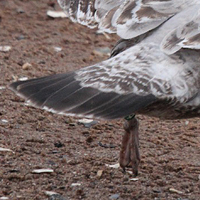 American Herring Gull (smithsonianus) 2nd cycle (2CY), October 14 2015, Stratford Point, CT. Picture: Patrick Comins. American Herring Gull (smithsonianus) sub-adult, October 31 2015, Port-aux-Basques, Newfoundland. Picture: Alvan Buckley. 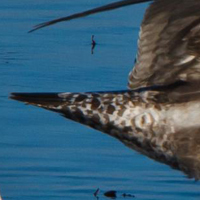 American Herring Gull (smithsonianus) 2nd cycle (2CY), October 31 2015, Port-aux-Basques, Newfoundland. Picture: Alvan Buckley. American Herring Gull (smithsonianus) 2nd cycle (2CY), October 17 2015, Stephenville, Newfoundland. Picture: Alvan Buckley. American Herring Gull (smithsonianus) 2cy (2nd cycle), October 19 2007, Dartmouth, Nova Scotia, Canada. Picture: P.J. Gergely. American Herring Gull (smithsonianus) 2nd cycle (2CY), October 07 2016, Michigan City, IN. Picture: Amar Ayyash.